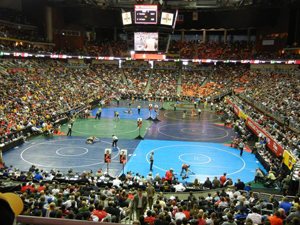 Wrestling fans filled Wells Fargo Arena for the NCAA national tournament. Thousands of people from across the country were in Iowa’s capital city last week for the NCAA Wrestling Championships and the people who helped bring the event to Des Moines say the feedback has been overwhelmingly positive. Greg Edwards is President and CEO of the Greater Des Moines Convention and Visitors Bureau. “I think this has put Des Moines on the map for major, major events,” Edwards said. Prior to the start of the tournament last Thursday, Edwards pegged the economic impact of the event at $15 million. “We ran some numbers late last week as to what we were projecting to have in and most of those numbers are holding true,” Edwards said. “We will reevaluate that later this week when we get some further data put together, but for right now, $15 million is where we stand.” Just over 16,000 fans filled Wells Fargo Arena to watch three days of wrestling. Tickets for the event sold out in roughly 15 minutes last March. Oklahoma City will host next year’s tournament.